With time and repeated muscle contractions from facial expressions like frowning and squinting, frown lines and crow’s feet appear. As we age, our face naturally loses subcutaneous fat and the facial muscles are then working closer to the skin surface, so expression lines and crow’s feet become more apparent. The facial skin also stretches a bit, adding to this loss of facial volume, see the information on Facial Fillers. Other factors that affect the facial skin include sun exposure, heredity, and lifestyle. Dr. Buono uses BOTOX® Cosmetic, which is a prescription medicine that is injected into muscles of the face and used to temporarily improve the look of both moderate to severe crow’s feet lines and frown lines between the eyebrows in adults. BOTOX® Cosmetic (onabotulinumtoxinA) is the only FDA-approved treatment to temporarily improve both moderate to severe frown lines between the brows and crow’s feet in adults. You can get treated in both areas at the same time— that’s the beauty of BOTOX® Cosmetic. 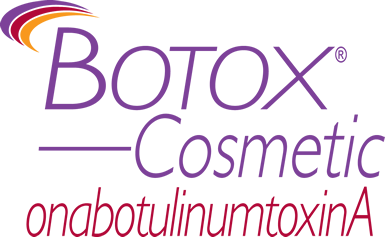 BOTOX® Cosmetic (onabotulinumtoxinA) targets one of the underlying causes of frown lines and crow’s feet; repeated muscle contractions from frowning and squinting over time. BOTOX® Cosmetic temporarily reduces the muscle activity so you’ll begin to notice a visible smoothing of these lines. For temporary improvement of moderate to severe crow’s feet, Dr. Buono will inject BOTOX® Cosmetic into the muscle surrounding the sides of your eyes, the orbicularis oculi muscles or to the corrugator and procerus muscles for temporary improvement of moderate to severe frown lines. BOTOX® Cosmetic (onabotulinumtoxinA) is a technique-sensitive treatment. You should not lose the ability to show expression when you are treated by someone who is licensed, trained and a medical expert in facial anatomy. The treatment takes approximately 10 -15 minutes and requires minimal downtime or recovery; bruising may occur if you take aspirin or certain supplements.